Despite the relatively recent adoption of HDMI 2.0 in the videocard and display markets, HDMI Forum Inc. have just published finalised details of HDMI 2.1 for industry partners. Another step-change in capability for the connection standard, HDMI 2.1 is set to incorporate native support for 8K at 60 fps, 4K at 120 fps, and new features such as Variable Refresh Rate and Dynamic HDR. 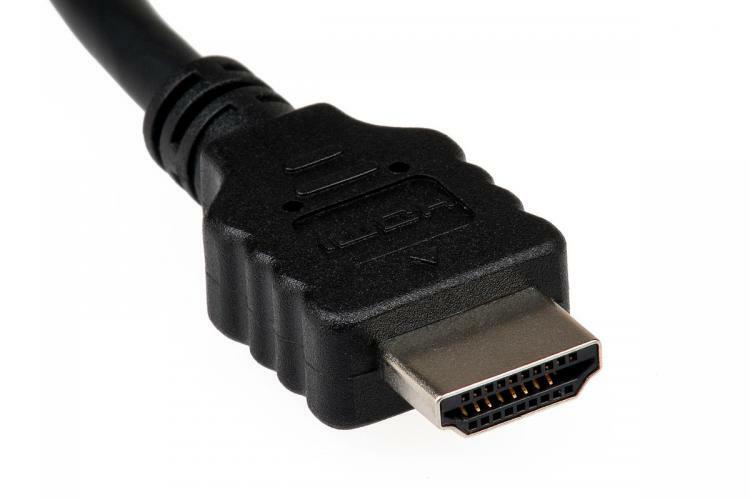 Alongside DisplayPort, HDMI is near ubiquitous in the PC space and for many the connection standard of choice from PC to display. With the launch of NVIDIA's Pascal architecture last year consumer systems transitioned to HDMI 2.0, which offered enough bandwidth to support 4K video at 60 frames per second with a 24-bit colour depth. However display resolutions and feature sets continue to grow, motivating the HDMI Forum to develop a new iteration that supports next-generation technologies. 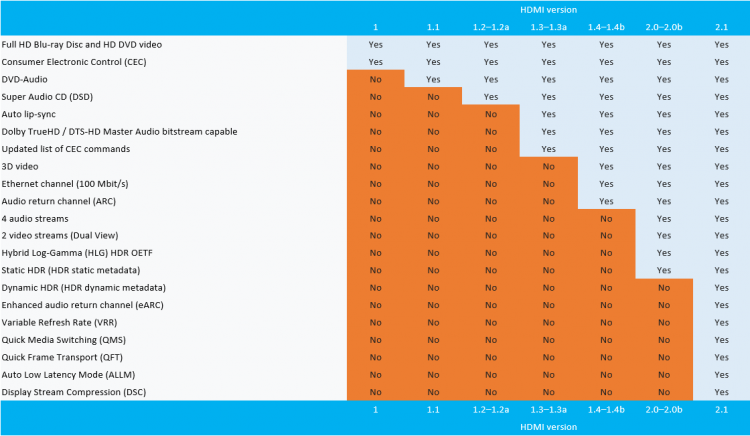 HDMI 2.1 was announce in January, and this week heralded formal publication of the standard. This new specification implements a number of technical improvements in order to boost the available bandwidth to 48Gbps, in so doing unlocking 8K60 and 4K120 broadcast standards between graphics processor and display device. Furthermore HDMI 2.0's High Dynamic Range support is built on to also support Dynamic HDR. Additionally implemented in HDMI 2.1 is Display Stream Compression, allowing for resolutions up to 10K at 100fps within the available 48Gbps bandwidth. 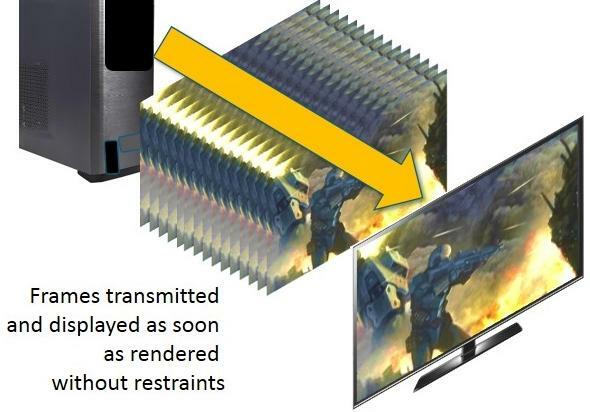 One of the most exciting improvements for gaming on PC in recent years has been variable refresh rate technologies that eliminate both tearing and the need for latency-heavy V-Sync. Initially available through G-Sync and then later FreeSync, it was until relatively recently restricted to DisplayPort devices. Late last year FreeSync was adapted to HDMI, and with HDMI 2.1 a more generalised Variable Refresh Rate implementation has been made. As with similar technologies, Game Mode VRR will reduce lag and stutter during gameplay for a more immersive experience. Alongside VRR is a feature known as Quick Frame Transport (QFT). Specifics haven't been released, but the intention is to reduce latency in order to improve the standard for Virtual Reality systems which are particularly latency-sensitive. It will be interesting to see whether NVIDIA choose to adopt VRR given their preference for G-SYNC as a solution to the issue of display lag, stuttering and tearing. On the other hand AMD are likely to embrace it early contingent on compatibility with future GPU architectures. To support new high bandwidth broadcast standards the HDMI Forum are introducing the 'Ultra High Speed HDMI Cable'. This cable, also to be known by the moniker 48G, supports the necessary 48Gbps bandwidth via three data channels operating at 12GHz, compared with HDMI 2.0 which operated at 6GHz. Many of the new features present in HDMI 2.1 - notably VRR, QFT and Dynamic HDR - are all supported through the old HDMI 2.0 cable standard, however high bandwidth video broadcast from 4k120 to 10k will require this new cable. 1. Higher video resolutions support a range of high resolutions and faster refresh rates including 8K60Hz and 4K120Hz for immersive viewing and smooth fast-action detail. Resolutions up to 10K are also supported for commercial AV, and industrial and specialty usages. 2. Dynamic HDR support ensures every moment of a video is displayed at its ideal values for depth, detail, brightness, contrast and wider color gamuts—on a scene-by-scene or even a frame-by-frame basis. 3. The Ultra High Speed HDMI Cable supports the 48G bandwidth for uncompressed HDMI 2.1 feature support. The cable also features very low EMI emission and is backwards compatible with earlier versions of the HDMI Specification and can be used with existing HDMI devices. 4. eARC simplifies connectivity, provides greater ease of use, and supports the most advanced audio formats and highest audio quality. It ensures full compatibility between audio devices and upcoming HDMI 2.1 products. 6. Auto Low Latency Mode (ALLM) allows the ideal latency setting to automatically be set allowing for smooth, lag-free and uninterrupted viewing and interactivity. Adoption of HDMI 2.1 by the Forum's partners is still some time off. Publication of the Compliance Test Specification for HDMI 2.1 is scheduled for Q1-3 2018, and hence consumer GPUs and Displays that officially support the new standard are unlikely to arrive this side of 2019.